"Matt Thomas" (a pseudonym) had only recently begun experimenting with marijuana when he got caught selling a few joints in the bathroom at his junior high school. It was no big deal, Thomas thought, especially considering that his parents  an investment banker and a homemaker  smoked pot too. But Thomas' grades had already begun to slip, perhaps because of his increasing alcohol and marijuana use; that, coupled with his drug-dealing offense, was enough for the school to recommend that his parents place him in an inpatient drug-treatment program. Thomas, then 13, was sent to Parkview West, a residential rehab center located a few miles from his suburban Minneapolis home. But rather than encouraging sobriety, Thomas says, his seven-week stint at Parkview West helped trigger a decades-long descent into severe addiction  from regular marijuana user to daily drinker to cocaine and methamphetamine addict. "It was [in rehab] that they told me that I was a drug addict and an alcoholic," says Thomas. "There was no turning back. The whole event solidified and created this notion in my own mind and in my social status. Who I was, was an alcoholic and drug addict." In treatment, Thomas met other addicts. He attended daily group therapy with older teens, who regaled him with glamorized war stories about drugs he'd never tried. In rehab, says Thomas, one's first question upon meeting a new person is, "What's your drug of choice?" And that's often followed by, "What's that like?" Thomas recalls hearing a description of an LSD high so seductive that he pledged he would try it if he got the chance. He did, not long after getting out of rehab. In academic terms, the problem is known as deviancy training, or the negative impact of friends on teen behavior  what parents would simply call a bad influence. In one 2000 study, in which researchers measured how much time teens spent together and how much they encouraged their peers' misbehavior, Dishion found that social exposure to delinquent peers at age 14 accounted for 53% of adolescents' life problems five years later  including criminal convictions, sexual promiscuity, relationship issues and drug use. 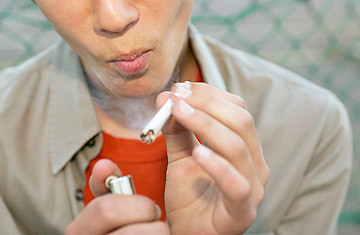 In another study looking specifically at the impact of group interventions, teenagers who had been identified as being at high risk for drug use and delinquency at ages 11 through 14 were more likely to smoke cigarettes and have disciplinary problems at school three years later if they had been enrolled in a teen focus group about drugs, compared with those who underwent private counseling sessions with their immediate families. "Any condition that promotes kids talking about or endorsing drug use [with one another] would increase the likelihood that the treatment would have a negative effect," says Dishion.